West Indies became the first team to be bowled out for fewer than 75 in successive Twenty20 internationals as they were hammered by England, who completed a 3-0 series whitewash. The Windies had been dismissed for just 45 in their run chase in a 137-run defeat in the second match in which England clinched the series, and they fared little better in Basseterre on Sunday. 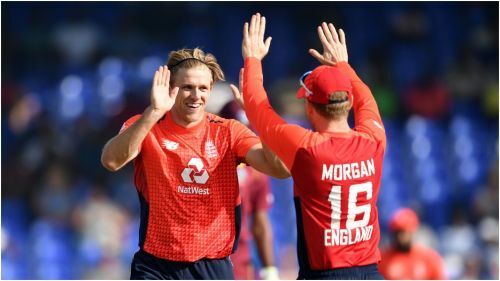 Having elected to bat, no Windies player managed more than 11 as they were skittled for 71 in just 13 overs, David Willey taking a career-best 4-7 and Mark Wood 3-9 while Chris Jordan produced some outstanding work in the field. England needed only 10.3 overs to chase down their meagre target, finishing a tour in which they lost the Test series and drew the ODI series with an emphatic eight-wicket victory. England win by eight wickets with 57 balls remaining and seal the series 3-0. Willey removed Shai Hope with the first ball of the match as the opener chipped to short cover, and it was he who dismantled the top order as John Campbell, Shimron Hetmyer and Darren Bravo all followed in short order. The largest partnership of the innings produced just 21 runs, and it was ended when Jason Holder slogged Joe Denly to Jordan, who then took a superb diving catch to dismiss the other architect of that stand, Nicholas Pooran, after a slower ball from Wood. Carlos Brathwaite went for a duck as he and Sheldon Cottrell also fell to Wood. Obed McCoy's 10 came from a six and a four, the number 11 then surviving a stumping before Adil Rashid bowled him with a googly to end the innings. Alex Hales (20) and Jonny Bairstow (37) were the only casualties from a serene England chase, which captain Eoin Morgan finished off with a six down the ground and a sweep for four.